Tell us about your experiences: let’s work together to help make secondary schools more inclusive. 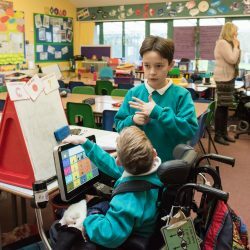 However, there have been no studies to find out if Accessibility Plans help Disabled pupils to feel included and part of their school communities. We are holding focus groups for the project in four regions in England – concentrating on Leeds, London, Bristol and Manchester. In each location we are holding discussions with different groups: Disabled young people and children, parents of Disabled learners, and educators and professionals. Disabled children and young people will receive book vouchers for their participation. The focus groups begin in November 2018, starting in Leeds. Further groups will be held in the other regions in autumn and winter. Through these discussions we hope to find out about any gaps between what the law says and people’s real-life experiences in schools. For those who can’t make it to a focus group, we are also conducting a survey for parents and one for teachers and other education professionals. Please take the survey and tell us about your experiences! Even if you don’t feel well-informed about Accessibility Plans, why not get involved and share your experiences with us? Your contribution has the potential to lead to real, positive and sustained change in schools as driven by yourselves. Help us help you to get Accessibility Plans which really work. We also welcome your participation through other means including email contact. For more information about the project, please contact Dr Armineh Soorenian at: Armineh.Soorenian@allfie.org.uk.